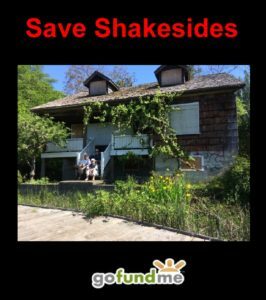 Artist Robert Bateman has sent a strong message of censure to the Town of Comox, which has now sent a petition to the BC Superme Court to overturn the Mack Laing Trust and demolish Shakesides, the house naturalist Hamilton Mack Laing built in 1950. Bateman, who has been aware of the campaigns by the Mack Laing Heritage Society to save first Baybrook house, built in 1923, and then Shakesides, comments that development and condos do not serve future generations as well as human and natural heritage. The Mack Laing Heritage Society (MLHS) has been lobbying the Town of Comox to retain at least one of Laing’s hand-built homes since 2013. Baybrook was demolished, despite public opposition, in August 2015. The Attorney General of BC prevented the demolition of Shakesides at that time, because the property had been left in trust to the Town and on his death, Laing left a bequest of funds to convert the house into a nature museum and maintain it for public enjoyment.